Blink my bleary eyes open and check my IG account for juicy pen updates. My number one pen inspiration is my friend who introduced me to the hobby! My brother got me a Lamy Safari (in Dark Lilac—woo!) for my birthday and it’s been full steam ahead ever since. First pen memory was filling up my pen and realizing how smoothly fountain pens write. It was definitely a game changer. I think I have about 20 pens...and too many bottles of ink to count. Don’t judge me! Recently filled up a pen with this nice, soft blue green color and it’s quite nice. COFFEE. 100%, no question about it. Journaling AND Calligraphy...though I’m decidedly better at journaling. Life is meant to be spent learning and exploring. We should be challenging ourselves every day! 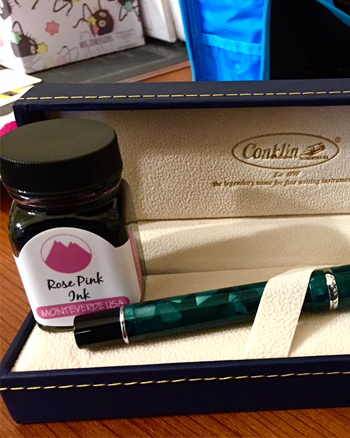 I’d LOVE to try a Conklin Duraflex as soon as they are back in stock. In terms of ink color, I’d love to find a nice, soft rose color that’s not too peach-y. 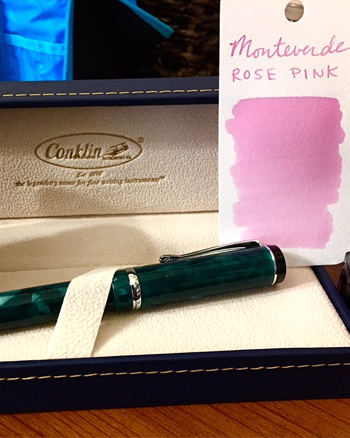 Conklin Pens, Monteverde, Goulet Pens, Anderson Pens, JetPens, Adpenworx, and Goldspot Pens. I spent a long time filling up my converters directly from the bottle to keep the nib and body of my pens clean, but then I would always have terrible dry feeds for a long time. Fill directly from the bottle through the nib and feed—primes the feed and your pens will write smoothly from the very start. I just don’t see myself buying highlighter colored ink...I don’t really see any practicality to it in a fountain pen because it’s illegible. I’m pretty open to any color ink, but browns don’t really capture my attention the way bright shades do. There’s definitely a different pen for every mood; traditional ones when we’re serious, and bright colors for excited energy. I seem to have a lot of demonstrator pens, so maybe I’m very transparent and easy to read? Yes, I 100% would sign that deal with a $10 pen—as long as it wrote well! The best pens are the ones we enjoy writing with, no matter their price.